Tubeworker, on the London Underground, is the longest-running of the bulletins produced by Workers’ Liberty. It has been running for fifteen years now. This article was based on the experience of Workers Fight, from which AWL has developed and which worked inside the International Socialists (predecessor of the SWP) at the time. It was part of a drive to turn IS towards production of factory bulletins at the end of the 1960s. It has been abridged. It was written by Rachel Lever (Rachel Matgamna), Sean Matgamna and Harold Youd. Memory suggests that Rachel was the main author. SM. It was about three weeks before the Reichstag election. In our district we discussed how we could mobilise factory nuclei for the struggle and also how we could utilise the election campaign for the activation of our nucleus work. In this connection we naturally came to speak of nucleus newspapers. Leon Trotsky discussed factory bulletins, and their place in the overall work of a revolutionary organisation, in a letter to his French comrades of January 1938. This leaflet was written by Vladimir Lenin after November 7(19) 1895, in connection with a strike of about 500 weavers against bad conditions and new measures introduced by the factory management. The weavers, by their solid resistance to the employer’s pressure, have proved that at a difficult moment there are still people in our midst who can uphold our common interests as workers, that our worthy employers have not yet succeeded in turning us for all time into the miserable slaves of their bottomless purses. Factory newspapers are an innovation in the life of the Communist Parties of the West. They had their origin on the revolutionary soil of the Soviet Union in the form of wall newspapers. 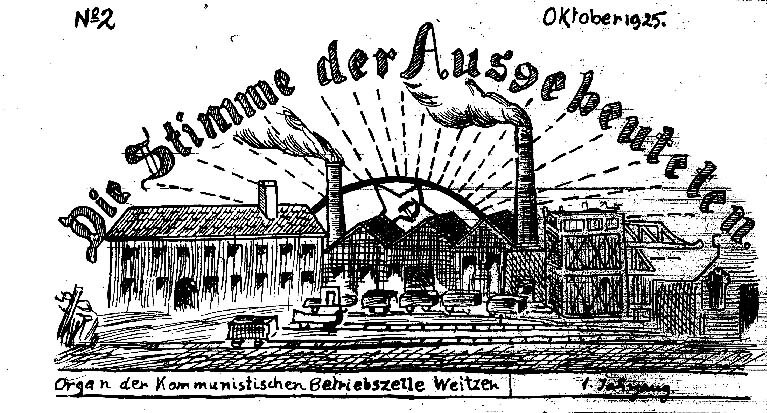 During the last year they crossed the boundary which separates the proletarian European East from the capitalist West, assuming the form of cyclostyled factory newspapers and becoming a form of agitation, propaganda and organisation which is really gaining in importance.